"Your first mission as our page administrator is to make sure that nothing on the page embarrasses us," clients often warn their community managers. That task is a bit easier thanks to Facebook's moderation tool which allows administrators to create a list of words that are automatically blocked from appearing in the comments of the page. This tool is particularly helpful to those in regulated industries, such as pharmaceuticals, who may even wish to not have certain products mentioned to avoid having to respond to a myriad of regulatory obligations. How does the moderation tool (blocking words) work? You can enter blacklisted terms from the settings section of the comments box. The content of new comments is checked against the blacklist of terms to see if this comment should have limited visibility. The comment is checked via substring matching. This means if you blacklist the word 'at', if the comment contains the sequence 'a' 't' anywhere it will be marked with limited visibility; e.g. if the comment contained the words 'bat', 'hat', 'attend', etc it would be caught. So how do you create your list of blocked words? 2. 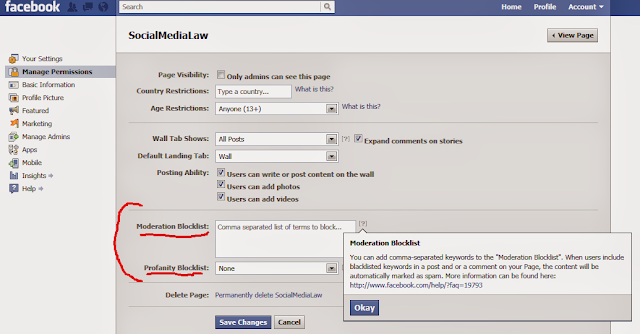 Enter words in the "Moderation Blocklist" block, separated by commas, that you would like to have automatically marked as spam and not permitted to appear in the comments or posts on your page. 3. To block the most commonly used profanities, select the level of blocking from the selections offered by the "Profanity Blocklist" tab. 4. Don't forget to click, "Save Changes". I want to know how to do this …. And you've just saved me quite a bit of time. Thanks for your tips. I’m wading my way through to work out which one or variety of options I need to implement. Was originally looking for how to automate the follow feature and welcome bit for Twitter. And give your remarks on email marketing book.